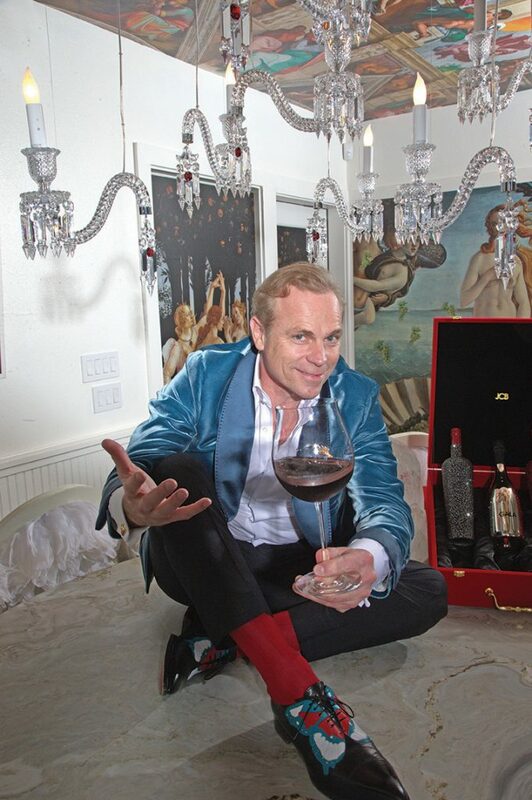 Jean-Charles Boisset was born into the world of wine in the village of Vougeot in Burgundy, France. Today he leads the family business, a collection of wineries that share more than 18 centuries of combined winemaking heritage and tradition in some of the world’s most prestigious terroirs, from Burgundy and the South of France to California’s Napa Valley and Russian River Valley. JCB, as he is known, has interests in many facets of the fine life including clothing, jewelry, candles and a new perfume, just to mention a few of his other luxury endeavors. Larry McGinn, President of IMI Agency, sat down with Jean-Charles Boisset for over two hours, talking, tasting exceptional wines and eating a gourmet lunch. This is a portion of what they discussed. Larry: I’m sure most of our readers know a bit about your background but can you expound on it? JCB: I was very, very fortunate to be born in a tiny village in the heart of Burgundy, named Vougeot. It happens to be one of the most historical, well known villages in the world of wine and viticulture because it’s the Clos Vougeot. The house I was born in was a 16th century home where my parents started the winery. My parents fell in love and then said “we need to start a business.” They started buying and aging wine — in the living room! I was born in a very humble environment and was very lucky in the sense that my grandparents had my parents on the later side, because of the war. Naturally, they lived next to us, so I was really raised in an environment where my parents and grandparents on both sides were alive, and very alive with us. So, I had kind of six parents at once. I was literally born in the vineyards making wine in a small village, knowing everyone in the village. I was not born in a penthouse in New York City or a fabulous apartment in Paris. I was born literally in the winery, making wine since day one! My parents took care of customers and administration, and we had a little cellar master. That’s how my parents got started. My background is really purely wine. I tasted wine all along from the youngest age, and my garden and best friend was Mother Nature. That’s where I played hide-and-seek, in the cellar and the vineyards. Wine has been my life forever, and I’m 48 today. My daughters are seven, and I was telling them last night how I had tasted and made wine already at their age. I was very lucky to have been raised there and be close to my grandparents. My grandmother was very much into pendulum energy, to sourcing as well as geo-biology, organic farming and biodynamic farming. She was very much into the ideas that you need to put compost on the roses, you need to recycle and treat nature as you would want to be treated, and how the bees have a function. I learned the art of organic farming very early on, since I was four or five years old. We had tasks: I was raised that you get something if you work for it, not like today. If I didn’t garden or work a full week, I would not get anything, whether it was a soccer ball or whatever. We didn’t have much, so you learned how to work for it. We had the opportunity to learn wine early on because my parents received customers at home, whether it was someone ringing the bell to come and buy two bottles of wine or someone who wanted more, usually a restaurateur, importer or distributor. I was like the little sommelier of the house, bringing wine from the cellar at proper temperature, serving it, setting the table with my sister, and cleaning the table and dishes. We would make a franc, about equal to a dollar today. Wine has been my life. I don’t know everything about it, but close — the making of it, the farming of it and the selling of it. The selling of it is more difficult. I worked every summer in all areas, the bottling line, the facility tasks, the harvest, everything. I studied something very different in school. Studying wine would have been redundant being so hands-on, and so I studied economics and finance. In retrospect, I realize I should have studied art; it would have been much more interesting. I was always in love with the United States. My grandparents resisted in the war, escaped and entered the Resistance, which was an amazing example. I was raised in Burgundy with the love of the U.S. In the 1970s, it was either the Eastern Block or the Western Block, with the U.S. to the west. But many people were drawn to the east. France was 20 percent communist in those years. I always loved the U.S., culturally, socially, economically, emotionally, aspirationally. I came here when I was 10 1/2 with my parents and grandparents on a trip; I fell in love with it and wanted it to be in my future. At 16 I had the opportunity to come to the French International School in Washington, D.C. Even at 16, I wanted to come to the U.S. and have a bi-cultural life, which I did. (To meet his military service requirement, JCB lived in Pennsylvania for a year and a half doing military work for a French company in the U.S.). I knew very early on I wanted a life to be in between, to use American entrepreneurship and the American way of life, the fun of life, the willingness to take risks, the sense of innovation and marketing. The sense of salesmanship of America and the tradition and heritage of France is something I still love. If you combine the two (countries) you have amazing energy. Lafayette said it, Alexis de Tocqueville said it in his book Democracy in America, and I’ve read them all — this has been my inspiration and I agree with them. The two cultures are the best. I think we are the biggest family investor in California on both sides (France and America). I think one without the other is not as great as the two together. I think that’s why we are growing and expanding the way we are and attracting so much of the two, because I really think American wineries are better, thanks to our French heritage; and our French wineries are better, thanks to our American dynamism. America is very dynamic and questioning all the time, which I love. This is why I love this country more than my own. I would be more American than French, and if I had to choose tomorrow for whatever reason, I would choose the U.S. And the French know that — they tease me always. I am more American in my way of thinking than I’m French. You may ask “why did you build so much in the U.S.?” Because I’m very energized by it, excited, bullish about it because I think what we’ve started is only the beginning. I feel we have only done the obvious. We’re building a great collection of wineries with an amazing group of people that are performing very, very well, and they’re dedicated to quality — not to me, but to our vision. We have a true vision of quality that has only started. We are attracting a lot of amazing brands, from Baccarat to Lalique and Bernardaud (place settings). We represent them and do a lot of things together, marketing programs and events, because we see the same world — like from Aston Martin to Maserati and Bentley in the car industry. We’re really bringing together a certain lifestyle: how we set the table, how we drink, the ingredients we use, all the way to accessories, glasses, plates and silverware, to how we serve, celebrate the table, relationships and friendships, and how we are formal but relaxed at the same time. We have fun but we are very quality oriented. This is why we have been successful, in a sense, because we can push the fun of it but we are very serious in the quality we have to offer. So it’s always playing on the fine line of excess and surrealism with quality always in mind. This is why a friend like John Legand decided to join hands with us; he is about quality like us, having fun but within quality boundaries. This is in a sense what we are as a collection of ideas, a collection of savoir-faire, a collection of know-how. Our gourmet store here (Atelier Fine Foods) represents Petrossian caviar, which is the best there is, the best smoked salmon, foie gras, the best cheese, the best San Daniele ham — the best of the best because we want our world to be part of that electric, magnetic energy around savoir-faire. We represent and make our own aioli, mustard and we make the most amazing marmalades. We collaborate with the maker and we represent together a know-how. That is what is so exciting to us, how together we want to represent this: an image that is really well thought of, from the grapes to the wine, to everything around it. We represent a certain lifestyle, an art of life that we want to live. Larry: I think the best word of the day is the dynamics. You have brought marketing over the top, a dynamic to the wine business that took it out of the agricultural ways of life a decade or so ago. Congratulations on that. Winemaking tool museum at Buena Vista Winery. Photo by Drew Clark. JCB: Thank you. We feel it is very important, Larry, to bring the world here and vice versa, to bring here to the world. So in other words, the world here is all the phenomenal savoir-faire companies: Baccarat circa 1764, Bernardaud 1840, Silversmith 1830 and San Louis 1598. From the JCB Tasting Lounge in The Ritz-Carlton, San Francisco to our reopened JCB Salon–Healdsburg (opened July 14) and our Beverly Hills location (Héritage Invites LVE & JCB opened June 21 inside of Héritage Fine Wines), it is all very exciting. We’re bringing Napa Valley and Burgundy and Sonoma to the town of Beverly Hills. Just a block from Rodeo Drive and Beverly Drive, you can be in our tasting lounge. It’s very important, as you have done very well as a company yourself, as your magazine says, to encourage people to “innovate, indulge and explore.” We want people to explore; we want them to indulge — to the point even that we have a winery and a concept named Secret Indulgence. We want them to plunge into our world. America today is ready to go to the next level. Over the past 40 years, thanks to Julia Child, Martha Stewart and so many others, America has taught us about food and great ingredients, preparing and cooking, the open kitchen and all that. Now the next step is really about food and wine pairing, wines, cocktails, great beers and setting up that whole amazing experience that you talk about — explore and indulge. That’s so important and that’s why we’re here. People in America are thirsty to know and what I love about America is people are humble enough to ask. That’s why we wrote our book, Passion for Wine: The French Ideal and the American Dream, and we sold out in 30 days. We have a certain “je ne sais quoi” that we love to showcase and present and that’s what we want to bring to people. Thanks to the on-premise market, which we love, because this is our world. Our world is fine hotels and fine restaurants. We are not as big in the grocery stores; this is not so much our business. The hotels and restaurants, this represents the art of the table, presentation, the wine list, wines by the glass and the banquets, and how we bring wine to the forefront, and we magnetize our guests and catalyze the energy within them. It is all about enjoying fine wines and great environments. Larry: How do we take your energy and your vision and your creativity to the consumer? Wine being opened: Raymond Generations Napa Valley Chardonnay. Barrel fermented, only 200 cases made. JCB: I feel there are three ways to answer your question. One, obviously through by-the-glass, the wine list and the menu. I’m a big fan of presenting flights, having an opportunity for the guest to enjoy three different wines to discover. Let’s say you have soft shell crabs or salad even, and there are three different Chardonnays: one from Burgundy, one from the Russian River and one from Napa Valley. So the guest can enjoy an escalation of senses of different tastes and flavors that they will not normally experience. I think our duty in the restaurant world is to constantly show innovation at the account level and show them a way to present wine that is slightly different — whether it’s through flights, kegs, or all the other kinds of innovations that we should bring at the restaurant hotel level. Secondly, I’m a very big believer of managing margin. So it’s not too pricey and people can have access to great wine at a reasonable price. The restaurant is where people will experience a lot of things. When you’re alone in front of a shelf in a store, it can be more difficult to decide, do I go to the $30, $40 or $50 wine? Larry: Not without trying it! JCB: Exactly. I think the restaurant world is a great platform in which to try. So I think we should use the wine list and wine by the glass to be experiential and to partner with the restaurants and hotel restaurants especially. It’s an amazing way for us to build a multi-level opportunity for the guests to really have a taste and an experience. Finally, I really feel as well, Larry, that we should bring more lounges and mini-lounges to hotels and restaurants, like we’ve done at The Ritz-Carlton in San Francisco. We opened the 700-square-foot lounge with couches and a little bar area. It’s only JCB wines and the guests love it. They get the chance to experience our wines while in the hotel. We literally bring the wine country to them. It doesn’t have to be so elaborate — we could have a more flexible way to present it, a less expensive way. Let’s do one in the InterContinental, with the Marriott and the Hilton, at the Waldorf. Or maybe it’s a pop-up, where we build the wine world there, so someone that typically drinks beer or cocktails, who is a transient traveler not used to fine wines, can, in a very cool way, enter that world and discover it. So I think we need to be innovative to partner together. Today, there is the winery and the hotels and restaurants. There are not enough combinations of both of them. TOP LEFT: Inspired by the traditional candle-lit cellars of France, the inimitable Crystal Cellar boasts stainless steel walls, a mirrored tasting bar and a collection of historical crystal decanters from Baccarat. TOP RIGHT: The Bubble Lounge at Buena Vista Winery. 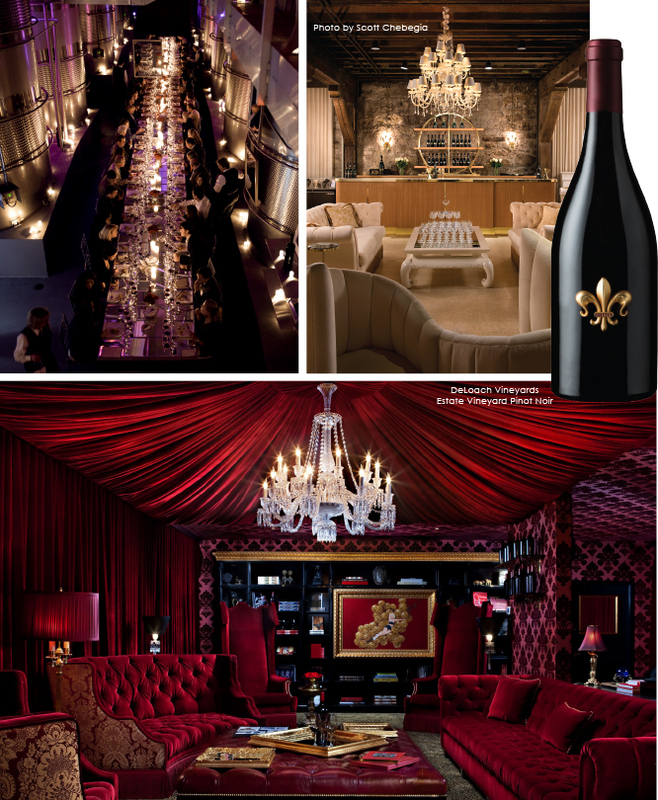 ABOVE: The intimate space of The Red Room at Raymond Vineyards is velvet lined and lit by Baccarat chandeliers. Larry: Sixty-five percent of the wine sold through a hotel is sold in banquets and catering. How do we take the success, the uniqueness and the tremendous experience of your home-tasting ambassador program and bring it to our national chain hotel clients? JCB: This is a brilliant question. How do we do this? I really believe we summarize everything through people. The Boisset Ambassador Program is all about people. This program is just a mirror of what I saw my parents and grandparents do around the table. “Please come in and sit at the table, and enjoy our wine, have a piece of cheese, have some ham!” I really feel by identifying carefully a whole series of bars, restaurants and hotels and allowing our Ambassadors to bring people there, we can build a program for it where they can make people dream. I’m going to use an example, like the Loews Hotel or the Four Seasons Hotel in San Francisco on Market Street. We have many Ambassadors who would love to have a place like that to entertain. Let’s make it very easy to bring business. They could do a tasting and be there to enjoy food, and use the hotel as a platform to connect people. So the Ambassador could be an accelerator to bring people to this location, to connect them to there, as simple as that. I would like to have the 50 or more Four Seasons hotels in the U.S. to be open to all the Ambassadors to entertain at a special price, with a discount to purchase food and all that. The hotels could provide a flexible program that would allow the Ambassadors to bring their wines and use the facility to have people drink and do business, much as you allow a wedding or business meeting to happen. We do a lot of business with many of the great trademark restaurants and hotels, but we would like to create something of a more formal agreement. We have over 300,000 followers; it’s a big base. We would make it a reciprocal program for the hotels and restaurants where we, in turn, offer the same discount at our wineries and tasting rooms. Larry: You’ve done a tremendous job pulling together a collection of family wineries, both in France as well as here. You’re big, yet you’re small enough to embrace a partnership with a hospitality chain like Morton’s, to create a blend; and to embrace a partnership with Cooper’s Hawk Winery and Restaurant, to create something you both share and you both win through. We’re seeing, as custodians of the beverage business with these clients, more interest by hotel chains and upscale dining to get into the blending, control or private label business. Do you see that happening as well? JCB: I think it’s a combination of vision. I’m going to use Tylor as an example (Tylor Field, III of Morton’s The Steakhouse) and Sandy Block of Legal Sea Foods. You have two really amazing people who really understand their brands and their customers. They truly are great because they did not ask us to change the branding but to add a specification to our brands for them exclusively. In terms of Raymond Vineyards Primal Cut (for Morton’s), what Tylor very well understood is that he recognizes we have a great brand in Raymond that people know; they feel confident with the brand. It’s Raymond, but it’s Primal Cut done with Morton’s and Tylor Field. Why I think it’s good is that Tylor has a great palate — I respect him immensely. He understands the menu at Morton’s The Steakhouse and he comes to us, our team — myself, our Director of Winemaking Stephanie Putnam and Vice President of National Accounts Mark Drake — to say “I would like you think about this.” He would still carry Raymond wines but let’s do a specific blend for this, because I feel it will be beneficial for our guests and is a different twist. I know that Tylor knows what he’s doing; I trust him. So I think it’s a good thing in that sense. We are not diluting our brands, we’re enhancing them with Morton’s and Tylor, and that adds value. If a large operation says “I want my private label to be protected and to bring more margin,” I understand why they want to do it but I’m not as bullish because the mission and the vision are different. Let’s do it with our brands. Why do I always want to push our brands? Because we are legitimate. I’m for working with an endorsed existing brand if you really push for it and you’re a great friend and it’s a cool concept, like we’ve done with Fairmont. Gen F has a very original package. We designed it together; we worked with Eric at Fairmont on it. He felt very strong about it for his banquets and how it would be a different consumer, so we did it. So sometimes it makes sense. I’m not saying no or yes — it really depends on the issue. I’m typically in favor of valuing the winery, endorsing it with the venue and when it’s appropriate, like with the Fairmont, branching out doing something that’s very cool and groovy. Larry: What do you think of the Millennials as wine consumers — the 21- to 36-year-olds? JCB: I’m bullish on them. I think they’re very curious, they’re extremely audacious in their choices, and they don’t mind spending $30 for a fine wine. They don’t mind going for something fun and unique. They are very interested in the making, the how-to of the making, the aging and why you made those choices. I’m very excited about them because in America, they’re going to be totally transforming the wine world, which is something that resonates with them because wine is a beautiful thing we craft, we create — it’s not industrial. Therefore, they have taste, they’re well traveled, they obviously have the world at their feet, and they have all kinds of food they’ve tried, so I’m very excited about it. I love tasting with them and they’re showing me a whole world I don’t know. Larry: Our chain hospitality clients are just starting to see them come in the door, from a hotel perspective. We’re finding they loved the Airbnb experience, but now they are tiring of it. It takes more work. If they have the money, they can just be pampered and catered to, and at the same time, have an experience. To your point, I think you’re absolutely right. And what’s cool is, we can all give you credit for thinking ahead a decade ago. JCB: We all want to be on a journey; we all want to dream; we all want to be transported. It’s one thing to come to the wine country looking at the beautiful vines, but that’s a happy few of us. 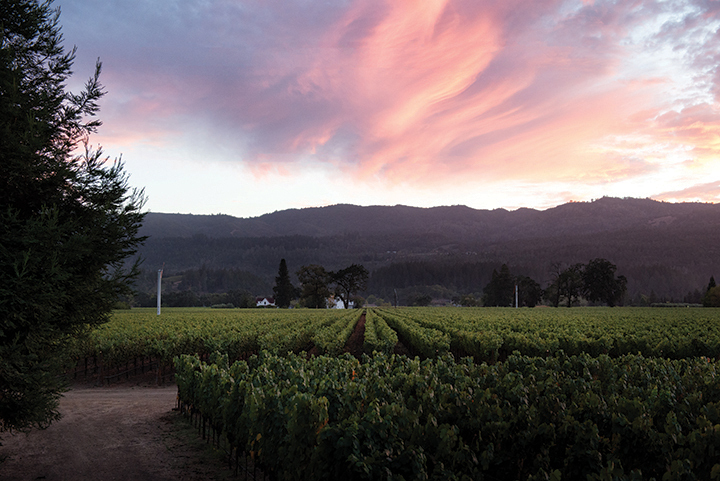 Three million of us come to Napa Valley a year and get to experience this lifestyle. I think the key in everything we do is to have knowledge. My big thing is education all the time, maybe because my grandparents were all schoolteachers. I love to go to places because I love to learn. That’s what really drives me to go to different places. I want to be awakened; I want to see things I don’t know, have new experiences. That’s the fun of it, to constantly discover and learn about food, a cocktail, or a juice, technique, philosophy, and the history of anything. What drives us in life is to constantly learn something new. I think that generation is curious. So, I like them a lot. 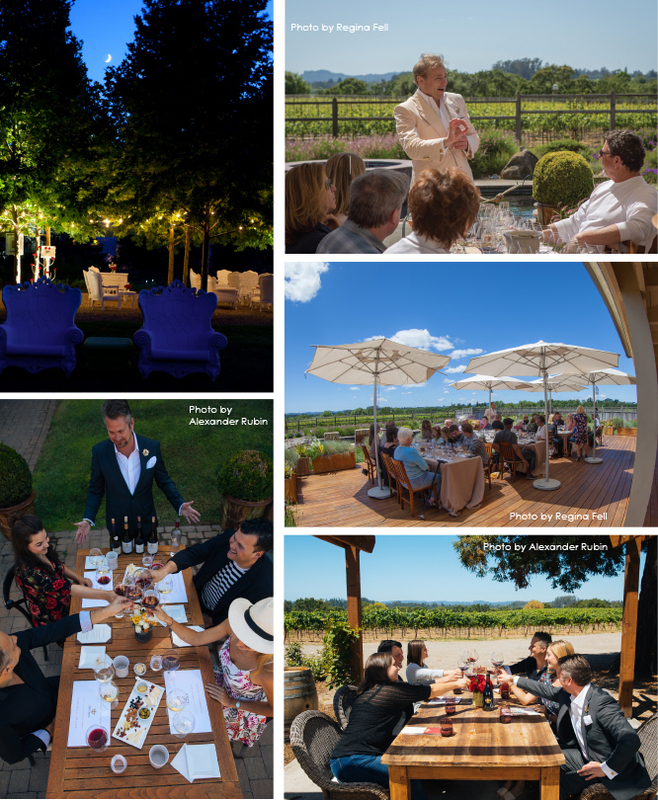 TOP LEFT: Raymond Vineyards Outdoor Living Room. BOTTOM LEFT: Deloach Wine Tasting. TOP RIGHT and CENTER RIGHT: JCB leading a wine tasting at DeLoach Vineyards. BOTTOM RIGHT: Deloach Wine Tasting. Wine being opened with lunch: a DeLoach Estate Pinot Noir, unfined and filtered, open-top fermented. Larry: About the trailing generation, Generation Z: If you believe what you read, they’re not drinking as much because they’re buried in their phones. Is it too early to even prophesize how they are going to impact the business? JCB: I really believe everybody will impact the way we want them to impact, if I may say so. What do I mean by that? If we’re great enough ourselves to inspire them to come to wine, they will. It’s up to us to inspire them, to find out what inspires them. We are doing something very natural and very unique and exciting that is wine. I really believe if they see wine the way we show them, they will enjoy it. Larry: You’ve been dabbling in high-end spirits for six months or so. At every tasting I’ve been part of that Mark Drake has done, everyone falls in love with them. So, the quality is there, the packaging is certainly there, but what do you see as far as commitment and growth? JCB: Thank you so much for asking. We are very bullish on all the beverages that are quality, that follow our certain vision: water, cider, beer, spirits, and obviously, wine and sparkling wine. On the spirits side, we really feel it is so exciting what is happening in America, because America leads the world in spirits, as you know — innovation, cocktails, phenomenal experiences. Many Europeans fly to New York and all over the United States to see what is happening. 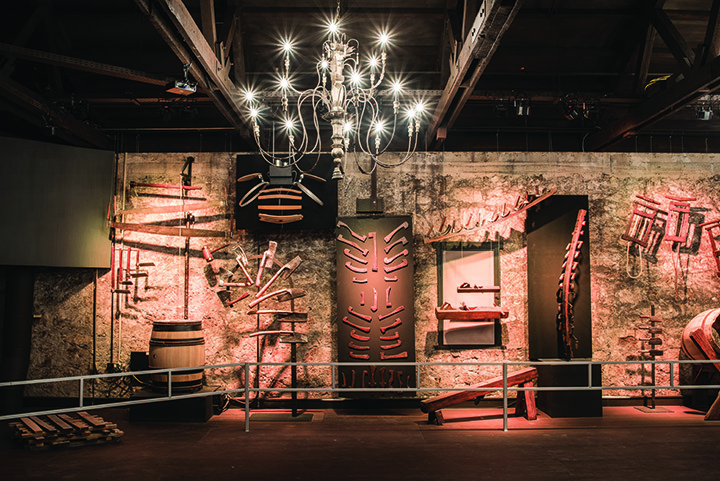 For us, it’s very fortunate that we have a distillery as well. We understand spirits, we were big in the business before, and we sold it. We used to sell Marie Brizard and many great brands, but we kept the super-premium end and the distilleries. We said to ourselves “wouldn’t it be great to focus on ingredients and super-premium spirits, very high-end?” These are things that are exciting and at the same time game-changers in the business. The JCB Spirits you’ve seen are obviously based on wine. So we make wine and then distill it. We went to the highest end — we infuse Vodkas with caviar and truffles, and use 44 beautiful plants for the Gin. Our view is, from the jewelry you wear to everything you drink, it should be within a certain vision — always of superior quality and enhancing what Mother Nature has given us, which is the ingredient. It’s the distillation of Burgundy grapes, the most expensive grapes on the planet! We want to do great things for the future that will last for a long time and are amazing. Our collectors and members all buy them for their ingredients. It’s an estate concept; that’s who we are. In every area, we feel we can add something unique that comes from who we are and we love to do it. Larry: In terms of planning for 2019, the on-premise is 25 percent of the business around the country, roughly, but a lot higher for you. National accounts are 38 percent of the 25 percent, so when you build your on-premise planning, are you going to follow the path you’re on? JCB: As we do our planning, we make wine that we love to make. I know I’ve said before that Mark Drake and all of us are really restaurant people, food people. So, for example, if you were to try the Raymond Reserve, it is soft, elegant, powerful, but not overly tannic and ripe so that it dominates the food. We really always have in mind the food to be a companion with the wine and vice versa, rather than have one overwhelm the other. That has always been a very important plan for us, to always make sure that we’re in a synergistic situation. Larry: That’s a great point because we have found over the last four or five years, especially in the hotels, there are few beverage directors anymore, or food and beverage directors, that came out of the kitchen. There are a lot more chef and beverage people making the decisions. Your vision fits right in with that. JCB: That’s right. You know how often I go and see food and wine pairings and say “what the hell were they thinking?” The wine dominates so much you cannot even taste the sauce. Or the chef has been mad at the sun because it’s all about spices and you don’t feel anything and your mouth is on fire. I think what we try to do with our wines is we make elegant wines, which are meant to be enjoyed with food — we’re not here to make wine for a specific market or to get into a specific business. I think we typically make great wines to enjoy with food or alone, and we are not really saying the trend is there, so we should follow it. It may be a bad business decision in some cases, because if we had made very Parkerized wines in the ‘90s — big, powerful Burgundies — we could have sold more, but at the end of the day, the trend is over. Those were not drinkable wines and they wouldn’t age. Larry: The past couple of hours have been tremendous. Thank you very much for your time. Tylor even said to me that I would walk out of here re-energized by the way you think about wine, and how you have shunned the focus on commercialism for the sake of doing the right thing for the ecosystem and your customers, married with programs that entertain and educate. JCB: Thank you for saying that, Larry. We could be much bigger than we are today, with both imports and domestic. But, as you mentioned, the authenticity and doing what we love and being passionate about what we do, is what is most important in life — to go at your pace, to be pushed, to be challenged for sure, to be energized, to be inspired, but to follow a certain deontology to a certain level of ethic. As a company — and it is really all of us, from our vineyard people to our winemakers and the whole team — they are really in it for the right reason. We are all commercially interested in being successful, of course, and having people say “we love your wine,” but really, we are doing what we love to do. I think it’s a great privilege.